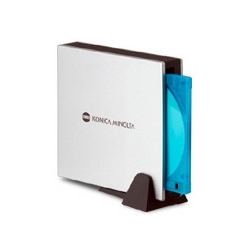 PDO Konica Minolta 3.5", 1.3 GB, Magneto Optical drive. External 'pocket-style' MO drive with USB 2.0 interface; separate power supply not required. USB cable and stand for vertical operation included. Reads & writes 128 MB through 1.3 GB.